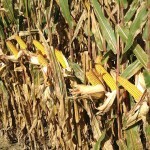 A scouting program that will help the grower manage their fields during critical periods of corn development during a growing season. This will help the grower make timely decisions that should improve plant health, and increase yield potential. A more intensive weekly/biweekly scouting program that include monitoring corn fields during critical corn plant periods (see above) and in between those stages to provide growers knowledge that will help drive decisions, improve plant health, and increase yield potential. A scouting program tailored to monitor soybean growth during plant establishment, early (through V3), mid (late growth-R2) and late seasons (pod fill-maturity); critical time periods, and during regional outbreaks (insects, disease). Nebraska research finds delaying weed control costs farmers 2% in yield for every leaf stage of delay in corn and soybeans. Leaf damage from insects slows photosynthesis: reducing plant health, slowing plant growth, ear development, pollination, and effecting yield.